I've tried a lot of different "ergonomic" shovels, blade sizes, etc., and I keep coming back to a simple, square, lightly curved metal shovel. 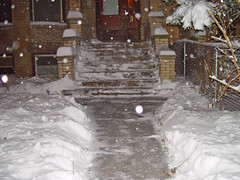 Note to self, Fuzzy, chill out on the OCD -- no need to "edge" the shoveled walk. Look, it's already snowing again. Let this serve as a reminder of man's eternal struggle against the chaotic forces of nature. 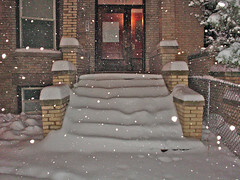 Get inside and get that mug of cocoa. There'll plenty to shovel tomorrow. This is SO me. And I do edge the sidewalks... And the driveway.... And the stairs... I even shovel out a pathway across the grass so I can get to my truck. It's not about not wanting to step in snow, I don't mind that at all. There's just something about, like you stated, working hard or in the cold and being able to look back on a job well done. When I'm finished my place, I'll shovel out a spot for street parking in feeling in my house, then move on to neighbors if I've already done my family's property's... Then I go inside, get some nice hot coffee, take a shower and go to sleep, and I sleep wonderfully! I have a bad back and I still have this urge to shovel thru it. Thank you for letting me know I'm not alone! !